Is One Better Than the Other or Should You Have Both? Let’s face it—for the average person, figuring out a retirement plan is hard. With all of the different investment and account types, strange acronyms and terms like 401K, IRA, 403b, Roth, and many more, it’s difficult to know what to do. IRAs and annuities are two common account types yet among the most misunderstood. Let’s take the mystery out of each. An IRA isn’t an investment. It’s an account that holds investments. It’s for one person only. Your spouse or other family members would need to open an IRA of their own. You can only contribute so much per year. In 2018 that amount is $5,500 or $6,500 if you’re 50 or older. Depending on income, you may not be eligible for an IRA. Penalties for early withdraws on all or part of the account balance. Most stocks, bonds, ETFs, and other common investment products are available in an IRA. Nontraditional investments like real estate, real property like jewelry, or investing in businesses might be available but come with a lot of complicated rules best left for sophisticated investors. The performance of the account depends on how well the investments inside the account perform. You’re subject to various market risks. The most basic difference between an IRA and an annuity is that an IRA is an investment product and an annuity is an insurance product. The greatest advantage of owning an annuity is that it provides a source of monthly, quarterly, annual or lump sum of income. Sometime in the future we will enter another period similar to 2008 where the investment markets plunge and take peoples’ retirement money down with it but people with annuities won’t feel nearly the pain that the IRA holders will experience. Annuities can be jointly owned. No contribution limits or income restrictions. You can fund an annuity in a lump sum and immediately start receiving checks. Many types of annuities to fit the goals of the retiree or their family. Often, the amount Is guaranteed regardless of market conditions. Typically higher fees and expenses than IRAs. Good vehicle for protecting assets. Just like there are traditional and Roth IRAs, there are different types of annuities. The fixed annuity will pay out a set amount based on the contract. A variable annuity allows for a more IRA-like vehicle where you can investment money into the market and your payouts are influenced by the performance. Annuities may also be shielded from bankruptcy or creditors in some states just as IRAs or other retirement accounts would be. First, this isn’t a one or the other decision. 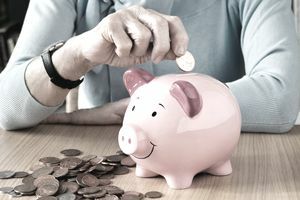 Not only can you have an annuity inside of your IRA—called an IRA-annuity, you can use your IRA to more aggressively build wealth while using an annuity to protect your nest egg. Insurance products aren’t as efficient at building wealth as investment products and investments product aren’t as well built for protecting your money as insurance products. In general, the closer you are to retirement, the more you’re interested in protecting your assets. An annuity might be more appropriate for the person or family who doesn’t have a lot of working years left. Why would Fisher have such strong words for annuities? Because some come with high fees. Some annuities are more reasonable in their fee structure but it takes a financially sophisticated consumer to understand what they’re buying but certain investment products inside an IRA can have high fees as well. You might pick an IRA or an annuity but there’s no reason you can’t hold both—especially if you maxed out your contributions in other tax-advantaged retirement accounts.